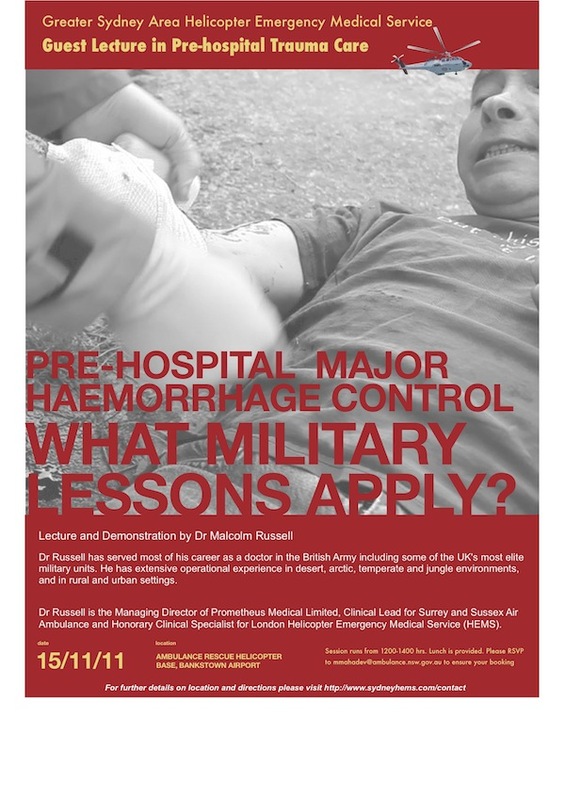 Dr Malcolm Russell, a HEMS specialist from the UK, will be giving a talk at the Bankstown base on 15th November. He has been involved in military pre-hospital care with the British Army and is now the director of a civilian air ambulance service. He is the managing director of a company called Prometheus Medical Ltd which supplies equipment and training to military and civilian services. We have invited Dr Russell to give a summary and demonstration of the latest haemorrhage control products. Knowing him, there will no doubt be a number of other show-and-tell goodies to accompany some of his fascinating case presentations. Contact mailto:mmahadev@ambulance.nsw.gov.au if you are planning to come so your place and lunch can be reserved.